October is here and colder weather is quickly approaching so grab a blanket, or two, and take a look at all the new goodies we have for you at Scraps N Pieces this month. This month's Designer Collab kit is Budapest. This bright fun kit is perfect to help add some pop to your layouts. You can pick up the Kit or Bundle on sale for the first few days of the month so hurry over to the store and snag your copy! Bits N Pieces is all new with a fantastic warm color palette, perfect for fall. With so many pieces to choose from you'll be set for pumpkins, orchards, a little Halloween, and lots of leaves! Each piece is just $1 through the 7th of October so hurry and grab your favorites! Day Dreams N Designs has your daily download this month. Visit the blog daily and pick up the add-on pieces to her new kit, At the Pumpkin Patch. Interested in getting a free kit? Growing Pains Scrapped has a wonderful kid Preschool Days available during the first half of the month as the free gift with purchase item. Spend $10 in the store at SNP and you'll get this kit free! 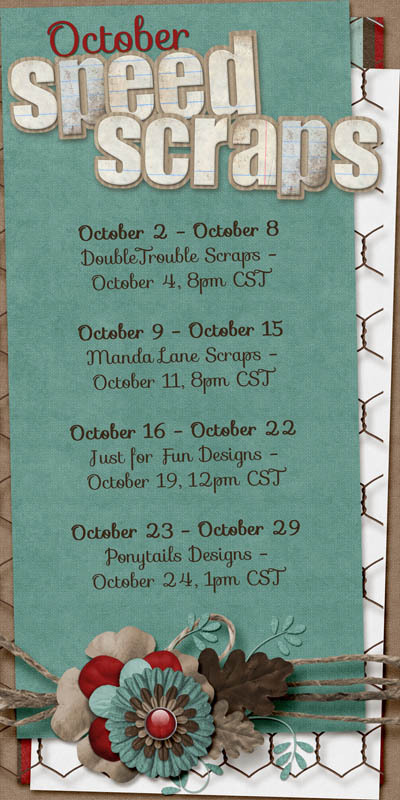 Don't miss out on the October Speed Scraps!